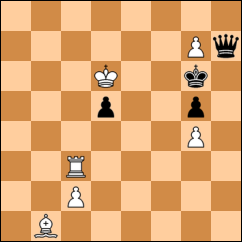 1…Qxg7 2.c3(c4)+ Kf6 (2..Kf7 3.Rh7 +-) 3.Rf3#. 3.c4+? Kf6 4.Re8 Qf7! 5.Bg6? Kxg6! 6.Re6+ Qxe6+ 7.Kxe6 dc -+. 5.Bg6!! Kxg6 6.Re6+ Kg7 7.Re7 Qxe7+ 8.Kxe7 d4 9.cxd4, win.